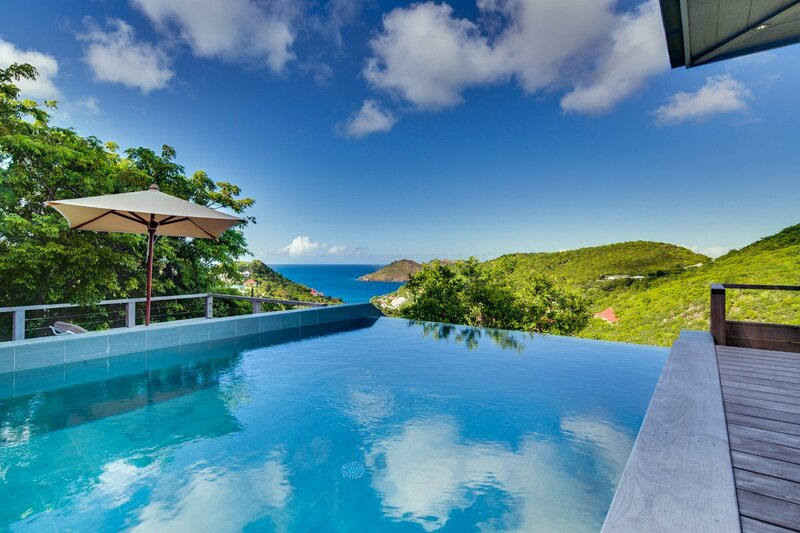 Once you settle into this villa, you may never want to leave! The views are as entertaining as any movie or club, and you can add some atmosphere by putting on some music and serving dinner and drinks on the covered patio. The pool has underwater lighting, so you can extend your day by relaxing in the pool and watching the lights come on in the town below. If you do want to get out for an evening, there are local restaurants just a couple of minutes down the road. Datcha Villa is located on a Flamands hillside, a short walk from the bakery and dining, and a few minutes’ drive from Flamands Beach. The infinity pool offers views of Flamands and the ocean, and secures guests’ privacy thanks to tropical gardens that hide the villa from view. Six teak lounge chairs with cushions dot the deck, and a covered dining area sits adjacent to the pool. The gas BBQ is perfect for grilling the day’s meal. Balconies above the pool deck enhance the ocean views. The deck opens to the interior living area, which features HDTV, a DVD player, sound system, and WiFi for entertainment. The modern kitchen offers an ocean view, an electric oven, gas stove, fridge and freezer, ice maker, dishwasher, microwave, coffee machine, toaster, and blender. All three bedrooms offer king-sized beds (twins upon request), ocean views, private access, air-conditioning, sun decks, and ensuite baths. The master bedroom sits on the upper main level, and the two remaining bedrooms are located on the intermediate level. This villa is perfect for couples traveling together or families with children (12 years or older). Duty-free shopping in bustling Gustavia is 5 minutes away, but the nearest restaurant is only 2 minutes away. 3 minute drive to Flamands beach. Upon arrival guests will be met at the airport by a member the villa management staff. After securing their rental car, they will follow them to the villa for an orientation of the property. Welcome over 12 years please.